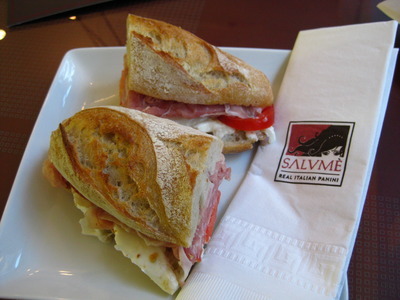 I was recently invited to sample Salumè, the newly opened ‘real Italian panini’ establishment in SoHo. The space itself is gorgeous – a square layout with huge picture windows in front, allowing as much light as there is in the sky right onto your table to illuminate the glorious food. There’s even a ‘mezzanine’ level of sorts in the back with more windows, a gorgeous chandelier, and excellent light. I watched a few sandwiches being assembled; lightly warmed/toasted bread then layered with the various offerings. 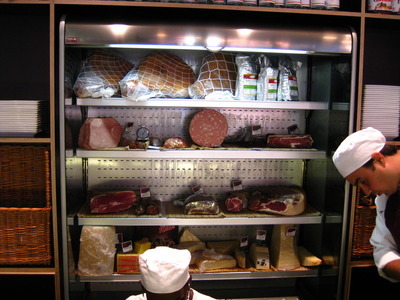 Meat case. 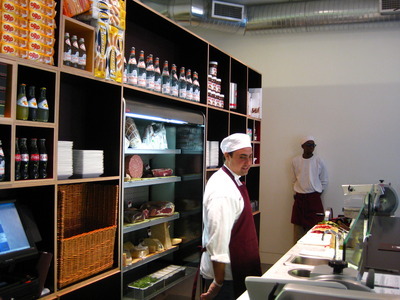 I stupidly didn’t manage to get a picture of the two huge red completely-manual-slicers flanking each end of the counter (visible in the corners of the above photos) – gorgeous slicers, you spin a wheel and everything works automatically. The “Ferrari of slicers” so we were informed. But you want to know about the food. Our first choice was the langhirano, which we were informed is the number one seller. Prosciutto crudo di parma, mozzarella di bufala, pomodoro, olio extra vergine d’oliva… spoiler alert: this was my favorite of the night. 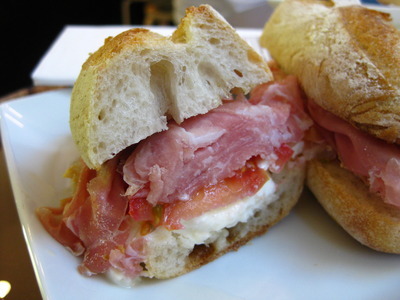 Melt-in-your mouth thin slices of prosciutto layered against the warm, crusty bread, with a bit of creaminess from the mozzarella… heaven. My only lament was wishing the tomatoes were thicker and a bit sweeter, but aside from that tiny personal desire, this was absolute perfection. Our second choice was the cortina- speck, fontina, peperoni arrostiti, salsa tartara (yes, tartar sauce). The owner had told us this was his personal favorite. 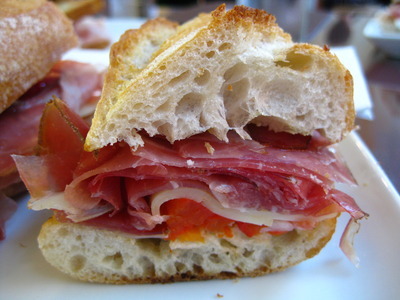 I enjoyed it – the roasted red bell pepper added another flavor to the sandwich – but I didn’t find speck too much to my liking, so the sandwich couldn’t be called a favorite. Still tasty – just not my personal preference. 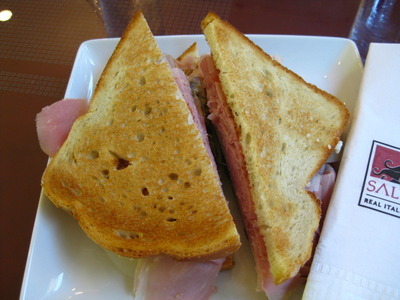 The last sandwich we ordered is found in the ‘toast’ section of the menu – “two Pullman bread [slices] play host to quality ingredients” – interesting. We chose the porto rotondo: prosciutto cotto, fontina, sottaceti, tarta. 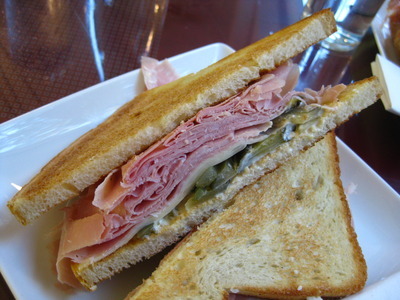 I really enjoyed the ‘something different’ brought to this sandwich by the pickles – a nice sweetness and a bit of crunch, against the salty ham and the lovely cheese. It was a very tasty alternative to the bread-heavier panini offered. Yum! Yvo says: Love the concept here and what I tried was very tasty. 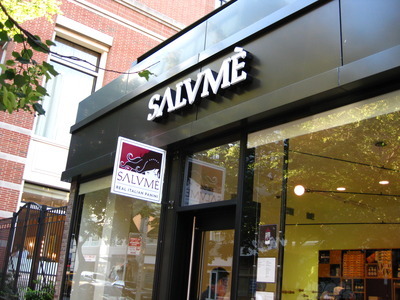 The space is gorgeous, and the people involved with Salume are completely lovely. However, the prices are a bit steep, though justifiable (the ingredients are high quality, no question)… just that for someone like me, on a student budget, though I want to go back, it’s a bit expensive. If this were last year, and I was still working, I’m sure my review would point this out but focus less on the first panini being $13.50, the second $12.50 and the last sandwich being $12. As I said, the ingredients and care going into the sandwich warrant the high price tag, but whether or not you personally want to pay that is only something you would know. 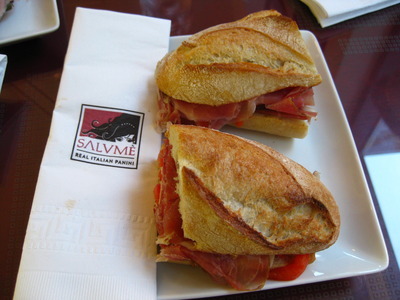 As invited guests at Salume, the above meal was complimentary. However, neither of us were under any obligation to write a review, positive or negative, and did not receive any monetary compensation to do so. Expressed herein are my opinions and my opinions alone. Thanks to Salume for hosting us!!! how were the rolls? did the meat get squeezed out as you chomped away? i hate that. 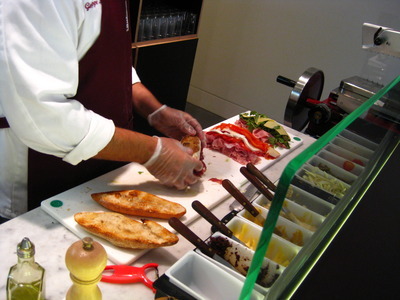 I have a picture of the meat slicer… definitely want to eat one of each panino. Now! Forget the sandwiches. Give me that shelf of meat! The meat monster within needs quenching. Meats and cheeses, ahoy! Their ingredients look fresh and they should be with those price tags. Yvo help me out here [or am I losing my mind?] I thought I had already read a review of this by you – or do I spend way too much time reading food blogs and found it on someone else’s site? eeek.